What Are the Six Broad Types of Climate Regions? "Cold" and "desert" may be two words that you never thought could appear together. But it is not temperature that defines a desert, but a very low average annual rainfall, which makes places like frigid Antarctica or Asia's Gobi Desert qualify as deserts. Cold deserts have soils similar to hot deserts, with soil types ranging from salty to sandy to rocky. Often, one desert has a mixture of soil types depending on wind and precipitation amounts. A number of cold deserts worldwide feature sandy soil. These deserts are more likely to thaw for all or part of the year. The sand allows some vegetation, such as grass varieties, to grow. Animals, especially insects, also live in the sandy soil areas of cold deserts. 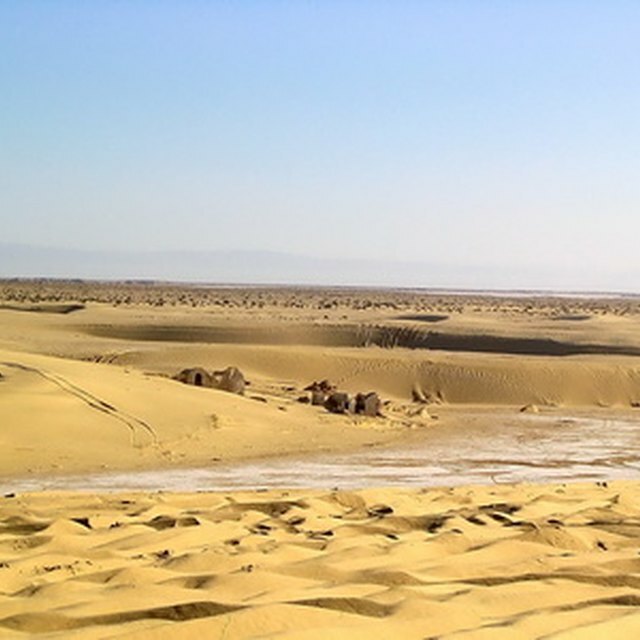 The Gobi Desert in China and Mongolia and the Turkestan Desert, which stretches from the Middle East to southwestern Russia, are examples of cold deserts with sandy soil. High salt concentrations characterize some cold desert soils. These deserts are more likely to be located near or on coastal areas instead of inland. The salt remains in the soil because these deserts experience very heavy, concentrated precipitation, usually from winter snowstorms. The areas still qualify as deserts because the overall annual rainfall amounts remain low. The Atacama Desert on the western coast of South America and the Great Basin Desert in the western United States feature highly salty soil over much of their terrain. Some cold deserts experience wind gusts nearly year-round. The wind carries away smaller particles such as sand, leaving rocks and pebbles behind. Rocky areas are more hospitable to vegetation than other cold desert soil types, provided the plants can withstand constant wind. Parts of Antarctica that are not covered in ice, such as the Dry Valleys, have rocky soil, as does western China's Taklamakan Desert. What Causes Deserts to Form? Philange, Tallulah. "Soil Types in Cold Deserts." Sciencing, https://sciencing.com/soil-types-cold-deserts-7569420.html. 24 April 2017.